Forget about designing on a dime. Here are ways to add to your pad without opening your wallet. 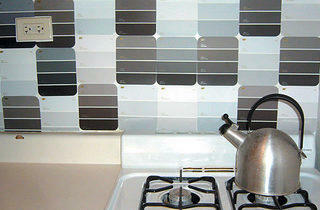 Photograph: Kevin Aeh CHIPS AHOY Paint-chip samples gave this kitchen an enlivening minimakeover. Collecting these colorful freebies from paint stores or home-improvement chains like Home Depot (locations around the city) is easy. Figuring out what to do with them is another story. I’ve seen mural and headboard projects, but I used them to make a kitchen backsplash. 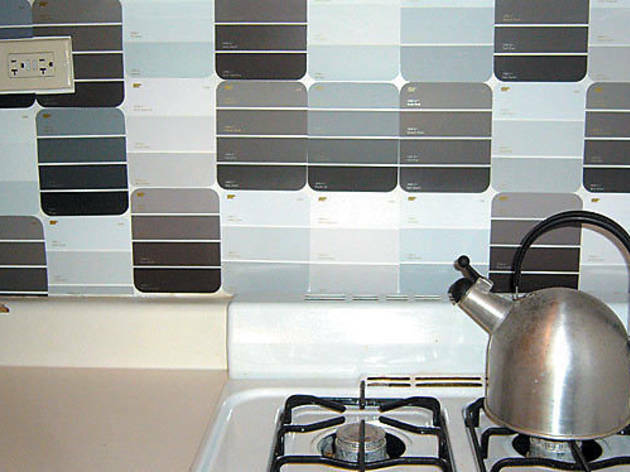 I created a random pattern with the long paper slips in shades of gray, white and black, and then stuck them on the wall between my cabinets and stove using double-sided tape. In less than an hour, it looked like a new kitchen. Hidden cost Guilt-prone DIYers may feel like thieves taking so many samples. It pays to follow local shops on Twitter. That’s how I found out SHE Boutique (483 Central Ave, Highland Park, 847-926-0150, twitter.com/SHEboutique) occasionally gives out free hangers. It recently had about three giant boxes of them that were free for one day only. Other boutiques often do the same, so be on the lookout. Hidden cost While they’re not made of wire, I suspect Joan Crawford wouldn’t approve of a closetful of cheap plastic hangers. We all know alleys can yield some surprising new (to you) furniture, but where to look? According to our Tossed & Found contributor Diana Durkes (finedivingchicago.com), the alleys off Ravenswood Avenue (from Lunt Avenue to Addison Street) are the best. “I’m not sure why, except maybe the streets dead end at the tracks so nobody goes there,” Durkes says. In the past, she scored an Oriental rug and a blond-wood night table. She adds that neighborhoods with single-family houses are typically good for larger items. Hidden cost That rug may have been thrown out for a reason. Is this how people get bedbugs? Last year, I was off to a rocky start on a felting project, so I brought my supplies and instructions into LoopyYarns (47 W Polk St, 312-583-9276), looking for a few tips. Instead, one of the employees helped me until the craft was completed. I thought I was special for scoring a one-on-one workshop, but it turns out the South Loop shop offers free assistance every Friday from 5:30 to 9pm. On “Let’s Knit Together” night, anyone can come in and knit or crochet, and the expert help is a bonus. Hidden cost If you don’t have your own supplies, buying them will cost actual money.